Tuesday March 1, 2016 becomes a great day for the Canadian online poker player TDO6H20G. 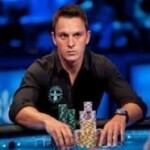 He won the Super Tuesday event for an amount $101,080, by defeating Stephen “woody1234321” Woodhead of Mexico. Woody1234321 becomes the runner up at the event and takes down $74,480. We all know “this is one of the most popular online poker tournament hosted by PokerSars’ on every Tuesday for a $1,050 buy in No Limit Hold’em. 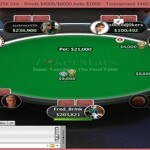 The tournament attracted 532 players thought out the globe and generated a prize pool of $532,000.Meanwhile top 63 places of the event were paid out. Some of the players got busted earlier and not able to play for final table were “HITTHEPANDA finished for 25 th position with an amount take home $3,192, Mark “AceSpades11” Radoja (10th), Gratitdude (11th) and Charlie “Epiphany77” Carrel (12th). Normy Dozer allotted seat#1 with 116,718 chips counts. Seat#2 was for brights88 and he had 367,933 chips with him. UK’s “pvas2” was at seat#3 for 234,408 chips. The seat#4 and 5 was for Nick “chilenocl” Yunis(273,904) and maggess88 (399,277). Seat#6,7,8 and 9 was for players as TDO6H20G(116,733), Stephen “woody1234321” Woodhead9492,486), moneyinbag (477,221),and Eccentric_BG(181,320). 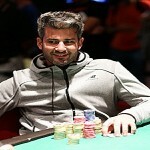 The first elimination from the final table was of brights88 from Lebanon. He finished his race at ninth position and got $8,831. Then Nick “chilenocl” Yunis of Chile hit the rail and finished at eighth position for an amount $11,970. The seventh spot is for UK’s Paul “pvas2” Vas Nunes and he made $17,290 from the event. Sixth position of the Super Tuesday goes to Australia NormyDoze and he got $22,610 as prize. Ffifth,fourth and third positions for the weekly Pokerstars Super Tuesday gone to the players like maggess88 (Netherlands) $29,260, Moneyinbag (Mexico) $41,496 and Eccentric_BG (Bulgaria). The heads up round took place between TDO6H20G of Canada and “woody1234321” of Mexico, and Canadian won the title and takes down the first prize of amount $101,080.